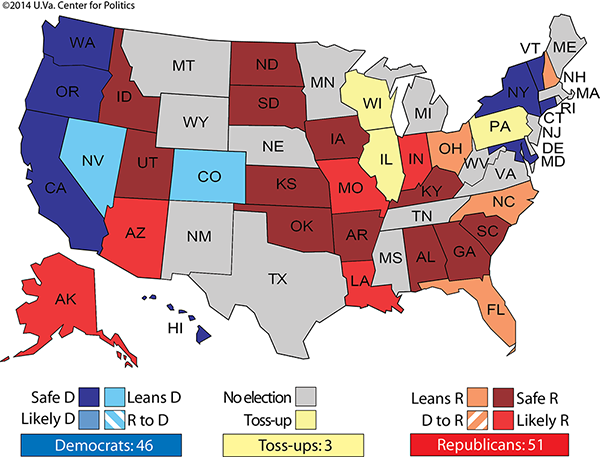 Larry J. Sabato's Crystal Ball » Can Democrats Retake the Senate in 2016? U.Va. Center for Politics Director Larry J. Sabato is contributing a regular column to Politico Magazine. This week, he examines the 2016 Senate playing field and Democrats’ chances of retaking the chamber. A version of this article originally appeared in Politico Magazine on March 2, 2015. It’s still too early to predict the Senate’s makeup in 2016, but it’s not too early to start thinking about who could land on the list of endangered senators. And in the 2016 cycle, it’s more likely to be a Republican than a Democrat. In 2016, the Republicans seem to have their backs to the wall, defending 24 seats to the Democrats’ 10. Just two Democratic seats — Harry Reid’s in Nevada and Michael Bennet’s in Colorado — are not solid, both in states where the GOP surged in 2014. In the Silver State, Republican Brian Sandoval would start as the frontrunner if he decided to challenge Reid, though the recently-reelected governor appears unlikely to run. It’s also not impossible that Reid, who says he will seek re-election, ultimately decides to retire. There are several potential Bennet opponents, such as Republican U.S. Rep. Mike Coffman, but no one that immediately suggests the incumbent is doomed. Moreover, both Reid and Bennet have an ace to play: Presidential level turnout will draw out a much larger group of Democratic voters, especially Hispanics and the young, than we saw in 2014. Meanwhile, Republicans must defend seven incumbents that represent states carried by President Obama in 2008 and 2012: Kelly Ayotte of New Hampshire, Chuck Grassley of Iowa, Ron Johnson of Wisconsin, Mark Kirk of Illinois, Rob Portman of Ohio, Marco Rubio of Florida, and Pat Toomey of Pennsylvania. An eighth state Obama carried in 2008 but narrowly lost in 2012 — North Carolina, home to two-term Republican Richard Burr — also merits mention with these other states. So long as Grassley runs for a seventh term — and he says that he will — it’s doubtful Democrats can credibly challenge him. But under the right conditions — i.e., strong Democratic Senate candidates combined with a solid national lead for the Democratic presidential nominee — all seven of the other seats are vulnerable. Three of the states (Illinois, Pennsylvania, and Wisconsin) are more Democratic than the nation as a whole and have a history of voting Democratic for president even when the party loses a close race nationally, as in 2000 and 2004. This reality has placed Kirk, Toomey and Johnson at the top of the endangered senators list. 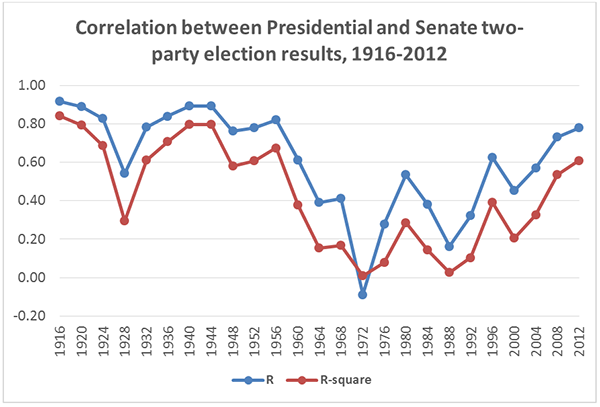 In recent presidential cycles, there has been a consistent uptick in the correlation between Senate and presidential election outcomes. That is to say, the Senate result in a state has tended to be increasingly aligned with the state’s presidential result. Excluding Maine and Vermont (where independents Angus King and Bernie Sanders won, respectively), the correlation in 2012 between Senate and presidential results was a strong .78 (1.0 would be strongest). This was the third straight cycle to see an increase in this correlation, and it is the highest since 1956, as shown in the chart below. Note: Excludes states where a major-party Senate candidate faced no major-party opposition, a third-party or independent candidate won the Senate race, or a third-party or independent candidate won the presidential race in the state in question. Given the incredibly sharp polarization in contemporary American politics, the growing relationship between presidential and Senate outcomes is unsurprising. More and more, voters are inclined to cast straight-ticket ballots when they enter the voting booth. But it may surprise many that 2012’s .78 correlation fell well short of correlations seen in years such as 1916 (.92), 1920 (.89), 1940 (.89) or 1944 (.89). Among the races that weakened the 2012 correlation were strong Democratic Senate performances in some Romney states, particularly Missouri, North Dakota, and West Virginia. Still, with no sign of an ebb in polarization, it seems reasonable to expect another strong relationship in 2016. All Democrats have to do to re-take the Senate is to win the three yellow toss-up states where they have a natural advantage, plus a couple of the current “lean Republican” states that have voted for Obama. And Democrats will need only one “lean R” state if the party wins the White House, guaranteeing that a Democratic vice president would break a 50-50 Senate tie. This appears doable. The Democrats’ job in 2016 is not much different than the GOP’s task last November. Republicans had, first, to hold their 14 seats in ruby red states plus Maine, where Republican incumbent Susan Collins was never in danger; and second, pick up at least six of the large pool of 21 Democratic-held seats. There were seven generally Republican states in the South and West (Alaska, Arkansas, Louisiana, Montana, North Carolina, South Dakota, and West Virginia) that were ripe for the plucking. As it happened, the GOP swept these seven and added the swing states of Colorado and Iowa, for a net gain of nine. Thus, another Senate flip in 2016, this time to the Democrats, isn’t difficult to imagine, but it’s far from a sure thing. It won’t be easy to dislodge the GOP so soon after the party has regained control — and collectively, the Democrats’ top targeted states are not nearly as blue as the top Republican targets were red in 2014. Obama won just 40.5 percent of the vote, on average, in 2012 in the seven Romney-state targets for Republicans in 2014; this was 10.5 points less Democratic than the nation as a whole. In 2012, the president claimed 51.9 percent of the vote, on average, in the seven Obama states targeted by Democrats in 2016 (excluding Iowa, where Grassley will be difficult to defeat if he runs again, but including North Carolina); these states were only one point more Democratic than the nation as a whole. With the exception of Illinois, and to a lesser extent, Pennsylvania and Wisconsin, these are not slam dunk Democratic states. Just a moderate amount of ticket-splitting would permit the Republican Senate nominees to run ahead of their own party’s presidential contender, which could represent the difference between victory and defeat. Go back to the map for a second. Notice that the most competitive races — the three toss-ups and the six leaners (two Democratic seats and four Republican ones) also take place in what should be among the most competitive presidential states. Of the yellow or light-shaded races, only Illinois seems assured to be uncompetitive in the presidential. And other than Reid in Nevada — who is a long-time but not especially popular incumbent — these races feature newer, non-entrenched senators. This is a recipe for Senate elections that are mainly tied to the presidential results. Let’s look again at the Democratic targets. First, even the three most endangered Republicans have a fighting chance. Kirk’s arduous recovery from a massive stroke has won him widespread admiration. This is a partisan era, for sure, and it’s not easy to win crossover votes, but the moderate Kirk will probably get a majority of independents and a handful of Democrats, regardless of which of a long list of possible Illinois Democratic foes is chosen to oppose him. Maybe the fact that there’s almost certainly not going to be a tight presidential campaign in Illinois gives Kirk more room to separate himself from the GOP presidential nominee, too. Toomey has carved out a less conservative record than many expected, especially on gun control and gay rights, where his libertarian leanings are evident. Keystone State Democratic party leaders are also not thrilled with ex-Rep. Joe Sestak, whom Toomey narrowly beat in 2010, yet Sestak remains the most probable Democratic nominee. Lastly, Johnson would likely have a difficult time duplicating his 2010 defeat of Democrat Russ Feingold in a presidential year in Wisconsin. As a former three-term senator, Feingold has first call on the party nomination to seek his old seat, and he appears to be gearing up to run with a united party behind him. Johnson is very wealthy and, despite hesitation on his part to spend freely again, he will do so if necessary. Longtime campaign finance reformer Feingold may reluctantly accept that he needs more big money from the party and other sources this time. The other targeted Republicans (Ayotte, Burr, Portman, and Rubio, if he ends up running for the Senate again) start their reelection bids as narrow favorites or better. While surprisingly little-known after two terms, Burr has handily won twice. If just-defeated former Democratic Sen. Kay Hagan runs, however, Burr will have his hands full. The other three Republicans have strengthened their political positions during their freshman terms, and should be regarded as more difficult to dislodge than some critics suggest. Of course, if, say, Hillary Clinton wins these states, any or all of the senators could be toppled, assuming Democrats choose wisely in selecting challengers. So far, former Ohio Gov. Ted Strickland, a Democrat, is running against Portman, and New Hampshire Gov. Maggie Hassan (D) is considering a run against Ayotte. And if Rubio ends up on the GOP national ticket or otherwise abandons his seat, all bets on Florida are off until we see the major-party nominees. There are plenty of other ways for the map to get more complicated for both sides. Democratic Sens. Barbara Boxer of California and Barbara Mikulski of Maryland are retiring. Both states are so blue that it is difficult to imagine how Democrats could lose either one, yet contests without an incumbent can be unpredictable. To this point, Democratic leaders have managed the Golden State opening well, rallying around state Attorney General Kamala Harris, while as usual, California Republicans are having a hard time finding a candidate who might credibly compete and win. Maryland is more of a question mark because Mikulski just announced her retirement Monday. Many of the state’s House members could seek a promotion, among others. The problem for Republicans is that the state should easily go Democratic in the 2016 presidential campaign, which probably keeps the Senate race from becoming all that competitive. But stay tuned. By the way, a surprise Democratic retirement or two could be in store since a shift to minority status can be jarring for senators used to chairing committees. Additionally, red state Democratic senators Heidi Heitkamp of North Dakota and Joe Manchin of West Virginia, whose terms do not expire until 2018, are reportedly contemplating gubernatorial runs in 2016. If they return home as chief executives, they can appoint replacements under current law, although both North Dakota and West Virginia are in the process of changing their laws and requiring special elections. Regardless, those seats will be much harder for Democrats to defend in the next cycle if they do not feature these incumbents. Republicans claim that all their incumbents are running again, including the aforementioned Grassley. We’ll see whether that assessment holds. In a presidential year, Iowa would probably be competitive for the Democrats without Grassley in the race. Sen. Dan Coats of Indiana might decide against another run — an announcement is coming in April, he said recently. Sen. John McCain of Arizona could still retire, or he might face a competitive primary or even general election. Additional GOP senators (such as Mike Lee of Utah, Jerry Moran of Kansas and Lisa Murkowski of Alaska) may face primary challenges — though as in California and Maryland, these states tilt so heavily to the majority party that a substitute Republican candidate would likely win the general election. How accurate have we been in predicting Senate races? For the last five cycles (2006-2014), we went back and examined our first Crystal Ball ratings that appeared long before Election Day. We initially assigned a lean, likely, or safe party rating to 144 of the 172 Senate contests. (The other 28 were judged toss ups, though it is our practice to call all races before the November election.) Our initial ratings proved correct in 89% of the contests and wrong in the other 11%. Nearly nine in 10 early predictions were accurate in the end. If that record holds, then the map you saw at the opening of this article may be basically the one you’ll see in November 2016. Due to polarization and the distinct blue or red character of most states, plus the money and name identification advantages possessed by incumbents, most Senate match-ups aren’t terribly competitive even in tumultuous years. On the other hand, there’s always a first time. Maybe there’s a giant turnover coming in 2016, complete with a scrambling of traditional blue-red lines. Maybe the presidential contest will turn into an improbable rout that generates strong coattails for the winning party. It’s those unknowns that will keep us watching and reassessing for the next 20 months.